An agreement easing the terms under which Russia supplies gas to Ukraine, reached on 19 November between Russian Prime Minister Vladimir Putin and his Ukraine colleague Yulia Tymoshenko, appears to alleviate fears of another gas crisis this winter. "We sincerely expect that all earlier reached agreements will be implemented and from our side we guarantee full implementation," Putin said after talks in Yalta with Ukrainian Prime Minister Yulia Tymoshenko. "It would be very good to meet the New Year without any shocks," Putin said. The Russian prime minister said Russia had agreed not to impose fines on Ukraine if it failed to use the volumes of gas it had agreed to. He added that Russian payments to Ukraine for gas transit would rise 60% in 2010 in line with earlier agreements. His words seem likely to relieve the European Union, which has anxiously monitored the talks in Yalta, southern Ukraine, for indications of whether a new end-of-year gas conflict endangering supplies to EU consumers was on the cards. Tymoshenko told Putin that Ukraine would scrupulously fulfil its obligations on the transit of Russian natural gas to Europe. "We will very carefully and distinctly carry out our part in the transit of the gas," the prime minister of Ukraine is quoted as saying. Before the talks, Putin had warned that Russia would cut gas deliveries again - or siphon off transit gas - if Ukraine stopped paying on time, under an agreement worked out last January. The January agreement, which the Russian prime minister brokered with Tymoshenko, ended a conflict over gas pricing which led to Russian gas flows to Europe via Ukraine being halted for two weeks in mid-winter. Millions in southern Europe were left without heating. Russian supplies across Ukraine provide Europe with a fifth of its gas and earlier this week an anxious EU agreed with Russia an 'early warning' mechanism to shield Europe from potential energy supply reductions in the event of further cuts. But relations between Russia and the pro-Western leadership of the former Soviet republic have slid further in the run-up to a presidential election on 17 January. 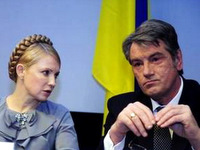 The gas deal has also become mired in infighting in Ukraine between Tymoshenko and President Viktor Yushchenko, her political rival. Though Ukraine has so far settled all its bills on time, Tymoshenko has conceded that, given the dire state of the economy, meeting the monthly payments for gas is a struggle. But she told Putin on Thursday: "Ukraine has paid and will pay on time." Using warm words which contrasted with a frosty exchange earlier in the day between Moscow and Kiev, Tymoshenko said the agreement she had brokered with Putin in January had represented a "breakthrough" in their energy cooperation. The Kremlin earlier snubbed Yushchenko, who had called for a revision of the gas agreement. It accused Kiev of trying to blackmail Russia and Europe over energy supplies. In an open letter to Russian President Dmitry Medvedev, published on his website, Yushchenko said: "Keeping the contracts unchanged [...] will create potential threats specifically to the reliability of supplies of gas to Ukraine and its transit to other European states." He believes the price accepted for Russian gas was too high while transit fees coming to Ukraine were pitched too low. Tymoshenko herself says the 10-year supply contract agreed with Russia does not have to be revised and provides for stable supplies of gas in 2010. Kremlin aide Sergei Prikhodko, speaking to journalists in Moscow, poured scorn on Yushchenko's plea to Medvedev. Ridiculing Yushchenko and Tymoshenko for constantly squabbling, he said: "We are categorically against energy security in Europe becoming dependent on the personal ambitions of Ukrainian politicians." "The attempt to intimidate Russia and Europe with forecasts of a crisis in the transit of gas -- this already looks something like political blackmail," he said. Prikhodko said gas relations between the two countries had a solid juridical base. "Of course these are not set in stone and we are always open to negotiations with our Ukrainian partners," he said. Medvedev last summer publicly wrote off relations with the pro-western Yushchenko, accusing him of pursuing anti-Russian policies. "Beginning 1 January 2010, Ukraine will for the first time receive a market price for transit of Russian gas through Ukraine to Europe and, accordingly, Naftogaz Ukrainy will receive billions of dollars in revenue," Ukraine Prime Minister Yulia Tymoshenko said, quoted by the Ukrainian press. "The fact that we have for the first time in 18 years signed a genuinely market contract truly strengthens Ukraine's sovereignty," Tymoshenko further elaborated. "It is a relationship between two equal partners. All the same it is pleasant to note that some easing of the terms for Ukraine helped these partnership relations to come about in the crisis year of 2009. That includes a 20% discount from the market price on Russian natural gas for Ukraine and, as a result, no fines," she said. "I understand very well all of the events surrounding the gas contracts in Ukraine. Many in Ukraine, including high-ranking politicians, don't like these contracts, because in preceding years, unfortunately, there was a mega-corrupt model for operations on the gas market," Tymoshenko recognised. Vladimir Putin has given Yulia Tymoshenko massive "gas support", Russian website Polit.ru writes. 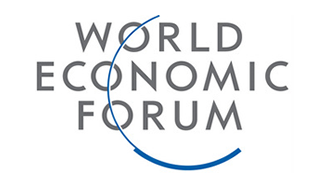 Presidential elections in Ukraine, due on 17 January 2010, are a major issue for Russia. Among the candidates, incumbent president Viktor Yushchenko is loathed by the Kremlin, while Tymoshenko, his one-time ally, apparently has the ear of the Kremlin. Ukrainian website Liga Novosti cites politologist Alexandr Kava as saying that the statements made by Putin in Yalta are a sign that Russia would be happy with a president in Ukraine in the person of Yulia Tymoshenko. He adds that these developments do not favour another leading candidate, Viktor Yanukovich, leader of the pro-Russian Party of Regions. 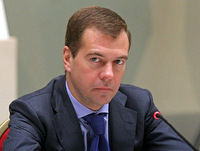 It also shows that "Moscow is not putting all its eggs in one basket," Kava said. Last winter, millions of EU citizens were left in the cold because of a gas dispute between Russia and Ukraine. Russian gas supplies to Europe via Ukraine - a route that supplies a fifth of Europe's gas - were halted for more than two weeks in January due to a quarrel between Moscow and Kiev. During the EU-Russia summit in Khabarovsk, the president of the European Commission, José Manuel Barroso, and the president of the Russian Federation, Dmitry Medvedev, agreed to strengthen provisions under the EU-Russia Energy Dialogue to prevent and manage potential energy crises. An 'early warning' mechanism to shield Europe from potential energy supply cuts was set up a few days ago.